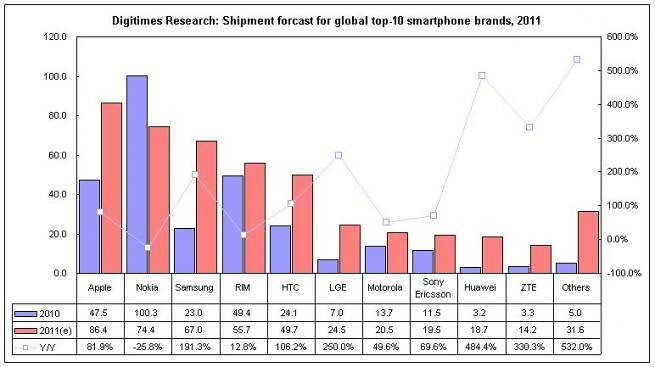 We knew in July that Apple had passed the imploding Nokia for the global smartphone unit lead by manufacturer. However, today Digitimes forecasts that by year end Apple will have sold 86.4 million iPhones by year which will easily best Nokia’s once insurmountable lead (Nokia had over double Apple’s share just last year). Apple’s smartphone shipments are projected to top 86.4 million units in 2011, up 82% from 47.5 million units in 2010. In contrast, Nokia’s smartphone shipments in 2011 will decline to 74.4 million units from over 100 million in 2010, said Luke Lin, analyst for Digitimes Research. Just because it almost doubled its unit shipment, doesn’t mean it is game over for Apple, however. Android makers Samsung, HTC, LG, Huawei and ZTE all showed better percentage gains though they shipped relatively few smartphones in 2010.